"The flag has its origin in the University of Antioquia (Universidad de Antioquia - founded in 1822), that nearly since its foundation had between its emblems a green and white flag that was hoisted in all its official acts. In 1962, by order of the departmental Assembly it was decreed the use by the department of the same flag as that of the University of Antioquia. 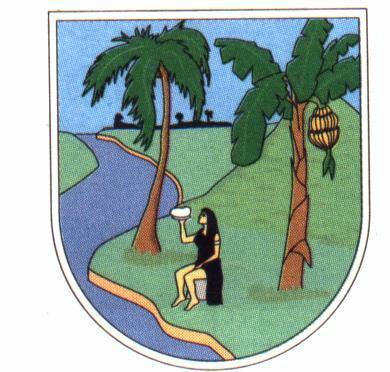 With respect to the departments coat-of-arms the government of the State of Antioquia determined by decree of 23 August 1812 to represent the coat-of-arms in the following form: a matron dressed and adorned like an Indian, sat at the bottom of a golden hill between the plane tree and the palm tree, with a copious river at her feet, wearing in her head the cap of the French revolution. The golden hill represents wealth and virtue; the palm tree, triumph and victory; the plane tree, abundance; the cap, freedom; the matron, the Antioquian race." Antioquia adopted the flag by Ordenanza 6 of 10 December 1962 ; CoA adopted on 23 August 1812 by Decerto number 21. The official information can be found at www.antioquia.gov.co/escudo.htm (official description of the Coat of Arms in Spanish) and www.antioquia.gov.cos/bandera.htm (official description of the flag in Spanish). Flag of Antioquia with Coat of Arms as seen at photo at www.metroseguridad.gov.co. I came across a variant flag featuring the flag charged with the coat of arms with a different color scheme for the coat of arms where the hills are yellow, a native woman wears a red dress and holds in her right arm a Phrygian cap. 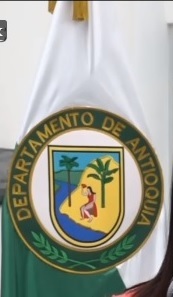 The flag also includes the words "DEPARTAMENTO DE ANTIOQUIA" in golden letters surrounding the shield in a green ring, and below are two laurel wreaths. matrona (a woman leader), the "Antioquian race"." Source: http://www.antioquia.gov.co/index.php/antioquia/datos-de-antioquia (which in turns quotes https://es.wikipedia.org/wiki/Escudo_de_Antioquia). Image cropped from a screenshot from TV news Hora13 aired today. I went to this gas station here in Medellin and saw several vertical flags. Among them is the vertical flag of the Department of Antioquia. Each one has its own flag, anthem and Coat of Arms. The fist Seal (which eventually developed into the first Coat of Arms) of the Department of Antioquia. Source: http://www.banrepcultural.org/sites/default/files/lablaa/revistas/credencial/marzo2010/imagenes/escudo2.jpg taken from this website. The respective GIF image is here. The inscription reads: "FE PVBLICA DEL ESTADO LIBRE E YNDEPENDIENTE DE ANTYOQVA" (in old Spanish), in current Spanish would be "Fé Pública Del Estado Lybre E Independiente De Antioquia", which translates as "Public Faith of the Free and Independent Antioquia"), surrounded by a palm (right) and and olive branch (left). Inside the Coat of Arms, in the first quarter, there's a tree with a crow (being the Coat of Arms of Santa Fé de Antioquia, the second quarter is a tower (being the Coat of Arms of Medellín, the third quarter is a lion (being the Coat of Arms of Rionegro, and the fourth quarter being two holding hands (being the Coat of Arms of Marinilla). 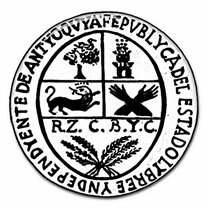 Below, are the initials R.Z.C.B.Y.C., that stand for Remedios, Zaragoza, Cáceres, San Bartolomé, Yolombó y Cancán (hoy Amalfi). Independence was declared on August 11, 1813 and this Seal was approved by the President of Antioquia, José María Montoya Duque, by Decree, naming it the "Gran Sello de Antioquia" (Great Seal of Antioquia) on September 2, 1813.